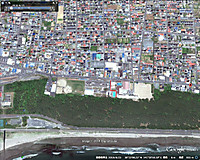 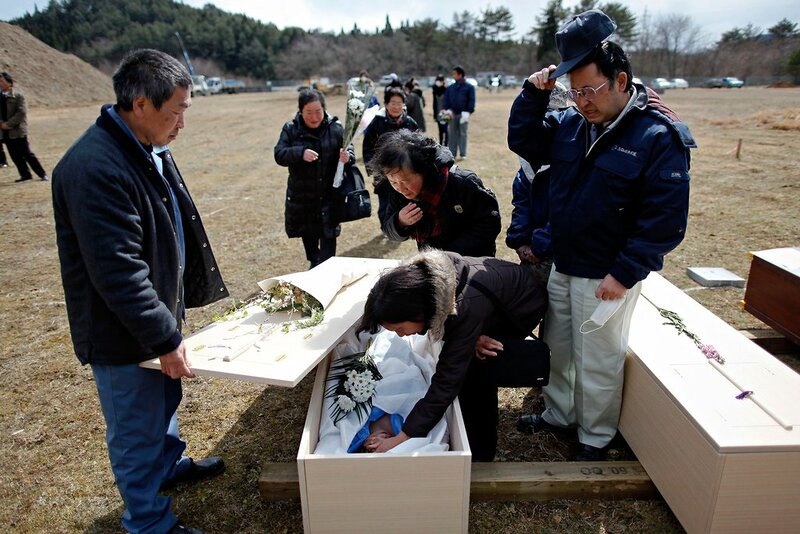 Unidentified tsunami victims were buried in a mass grave in the coastal city of Ishinomaki. 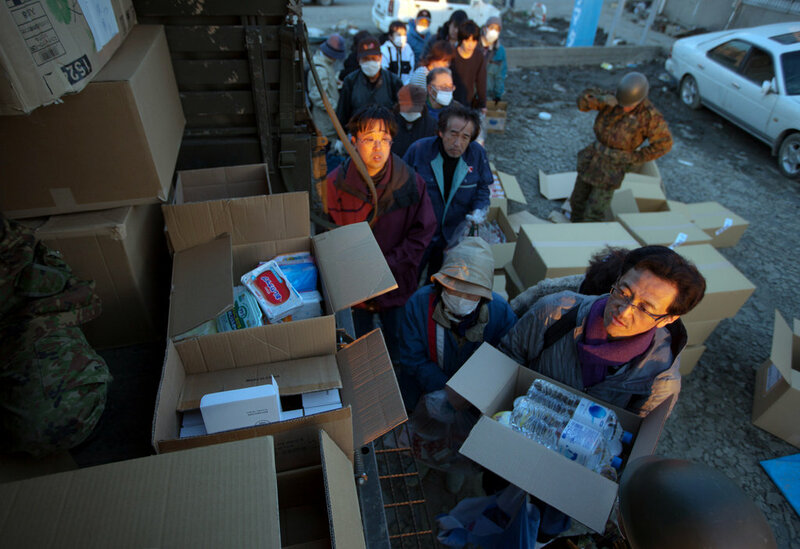 Japanese earthquake and tsunami victims received food and clothing distributed by the Japanese Self Defense Force in Ishinomaki, Miyagi Prefecture, Japan. 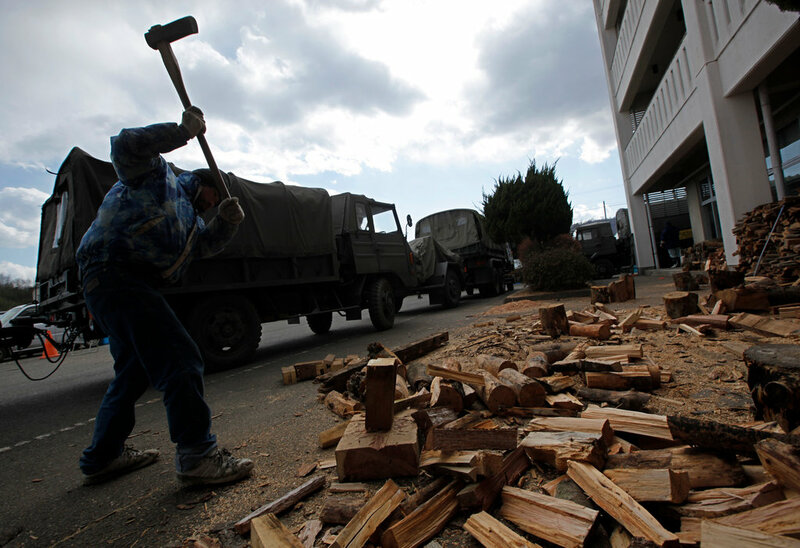 A survivor of the earthquake and tsunami cut firewood used for heat at a shelter for those who lost their homes in Yamamoto, Miyagi Prefecture. 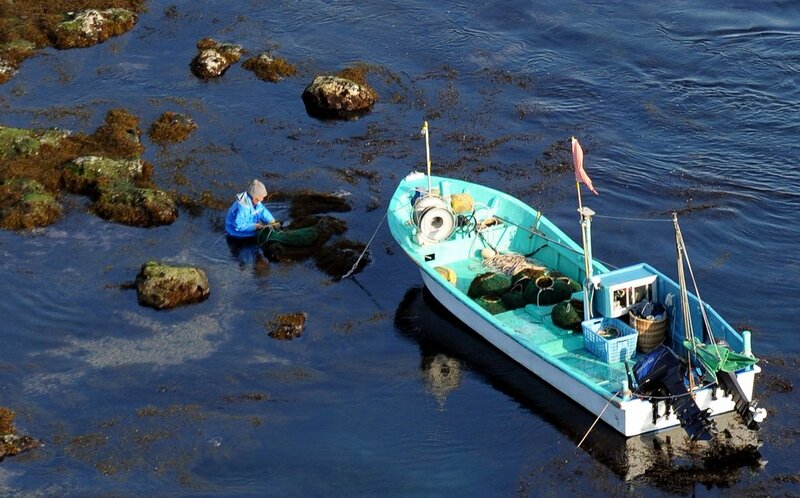 Despite the fear that radiation from the Fukushima Daiichi nuclear power plant is pouring into waters off the west coast of Japan, a fisherman collected seaweed near Katsuura, Chiba Prefecture, south of Fukushima. 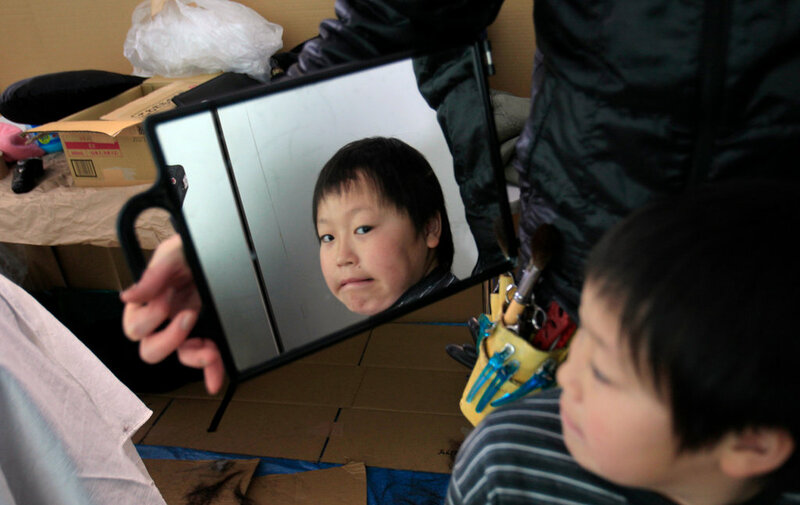 Ryota Sasaki, 10, checked his haircut in a mirror after a trim at an evacuation center in Saitama, near Tokyo. 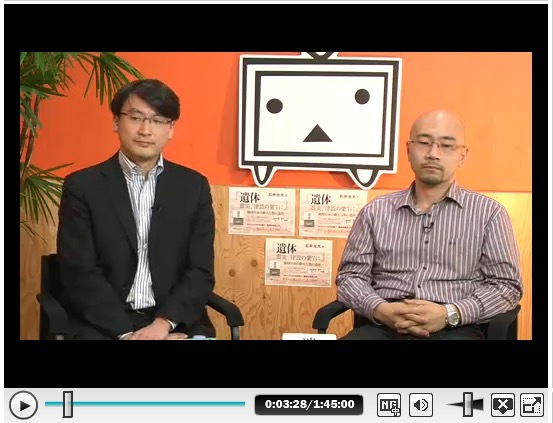 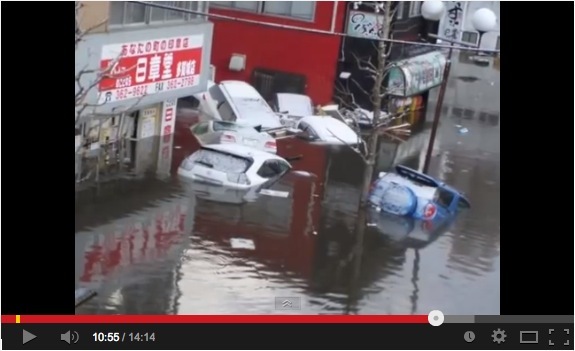 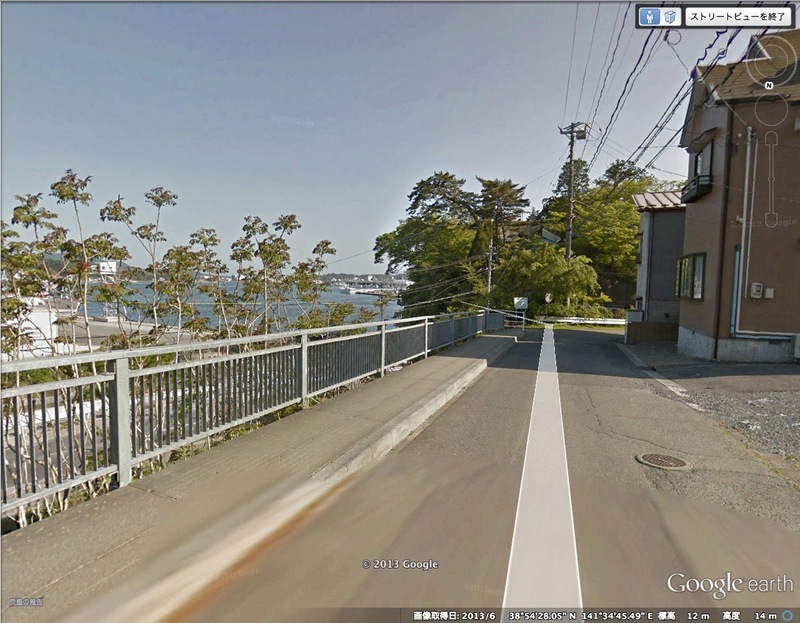 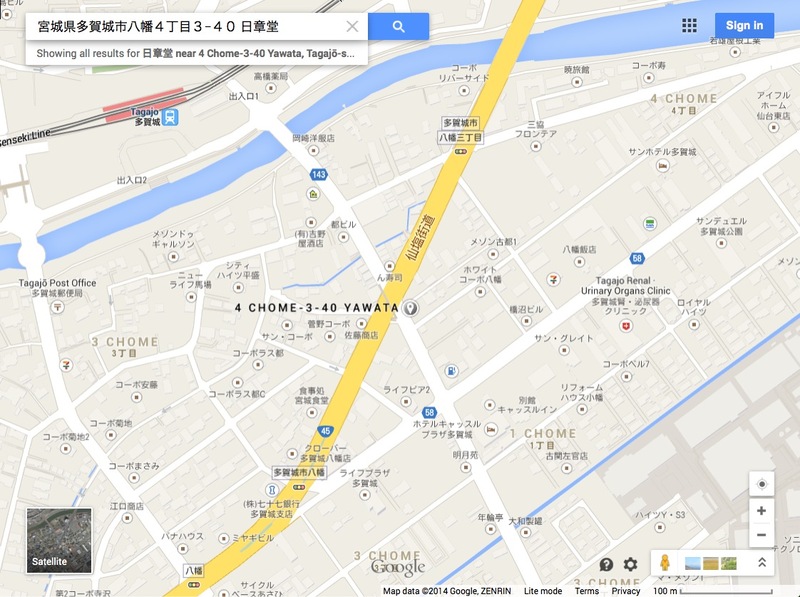 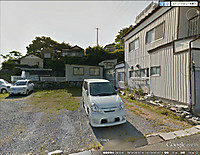 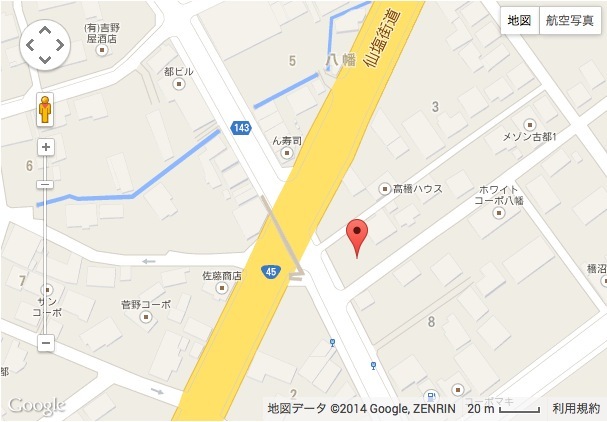 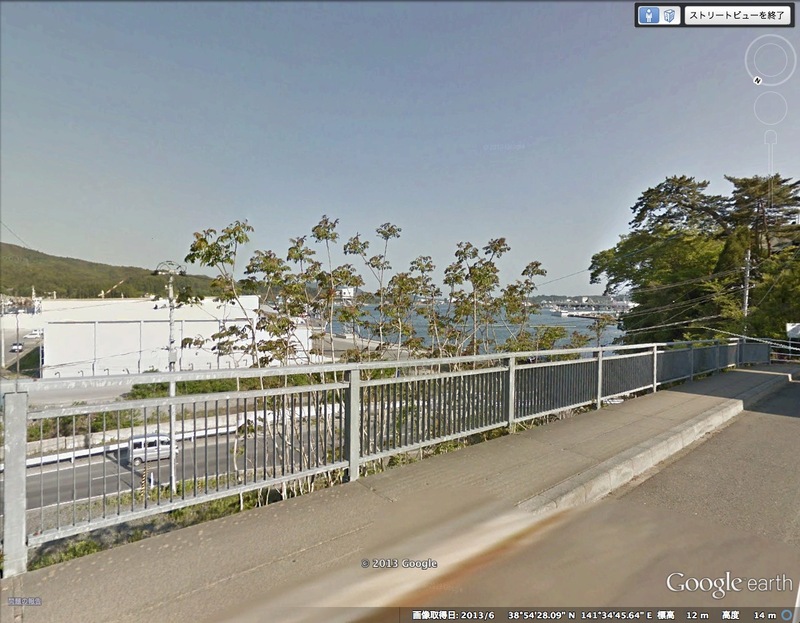 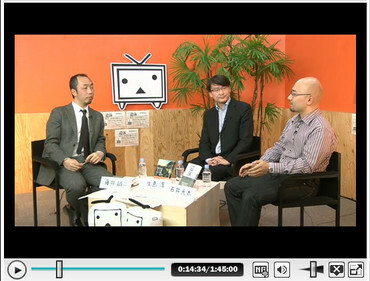 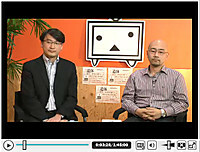 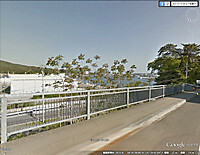 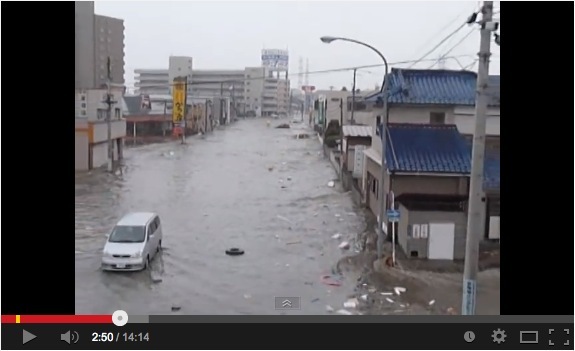 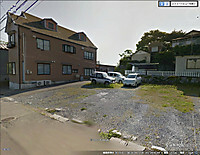 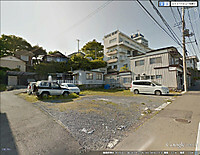 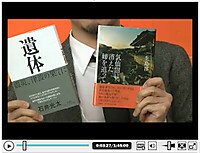 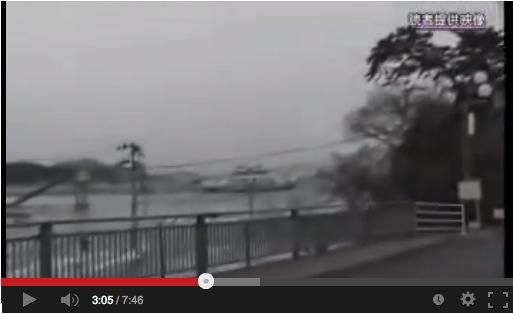 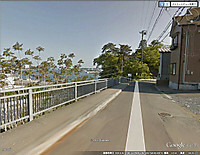 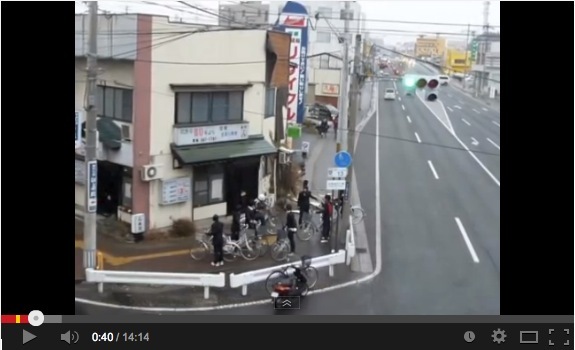 Ryoto was evacuated from Minamisoma, near the troubled Fukushima Daiichi nuclear power plant. 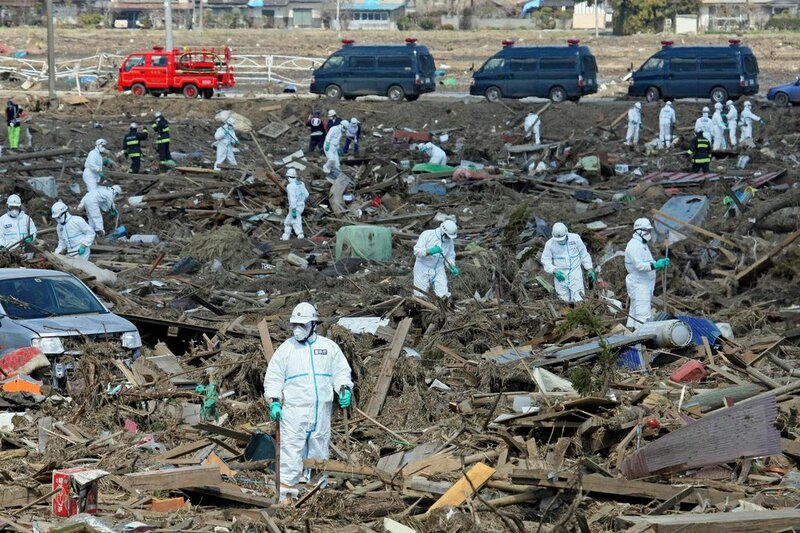 Police officers in protective suits searched for victims of the Japanese earthquake and tsunami in Minamisoma City, Fukushima Prefecture. 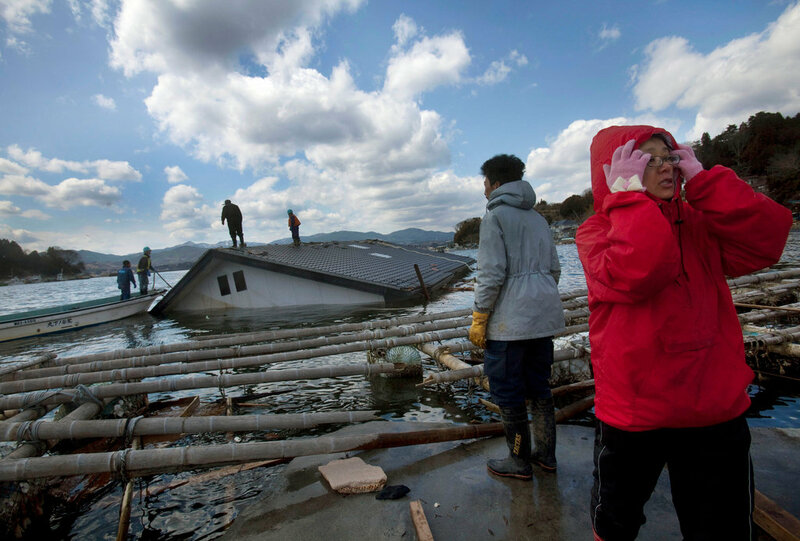 Reiko Kikuta, right, and her husband, Takeshi Kikuta, watched workers attempting to attach ropes to pull their home ashore on Oshima Island in Miyagi Prefecture. A group of women examined an article found near Okawa Elementary School in Ishinomaki, Miyagi Prefecture, where roughly 80 percent of the students and teachers were killed or are missing after the earthquake and tsunami. 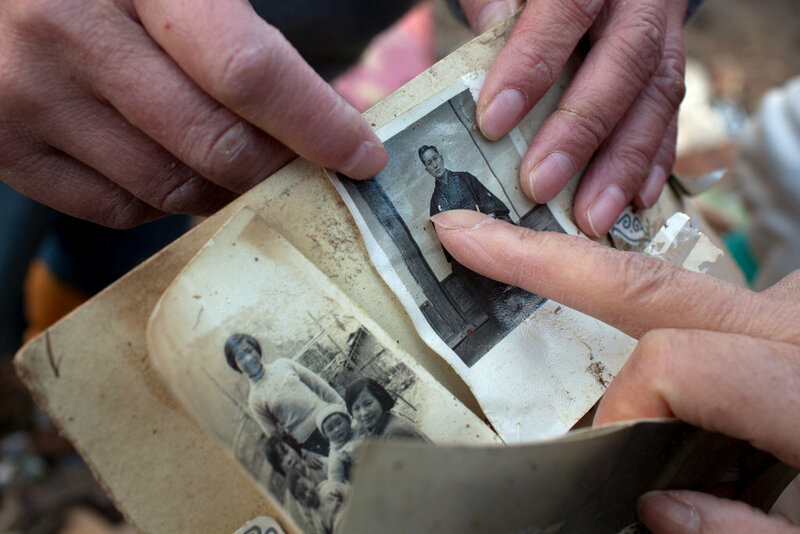 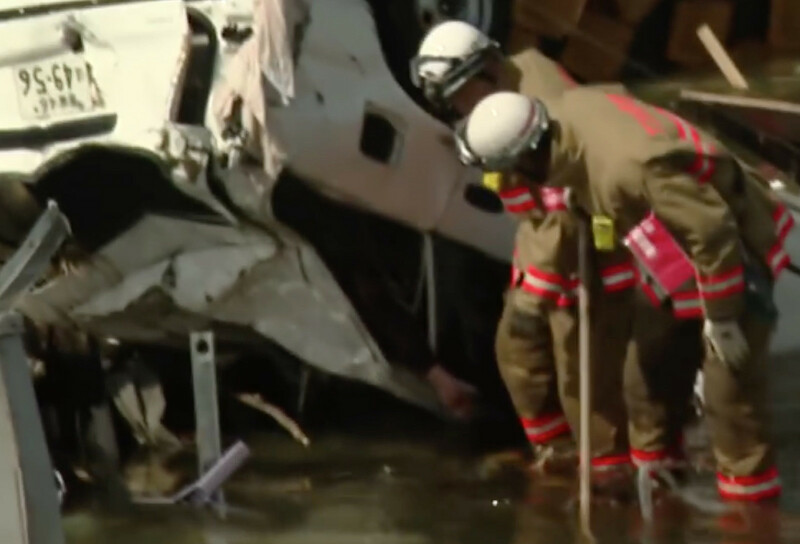 Family members retrieved photographs that belonged to their missing grandparents from debris in Minamisanriku, Miyagi Prefecture. 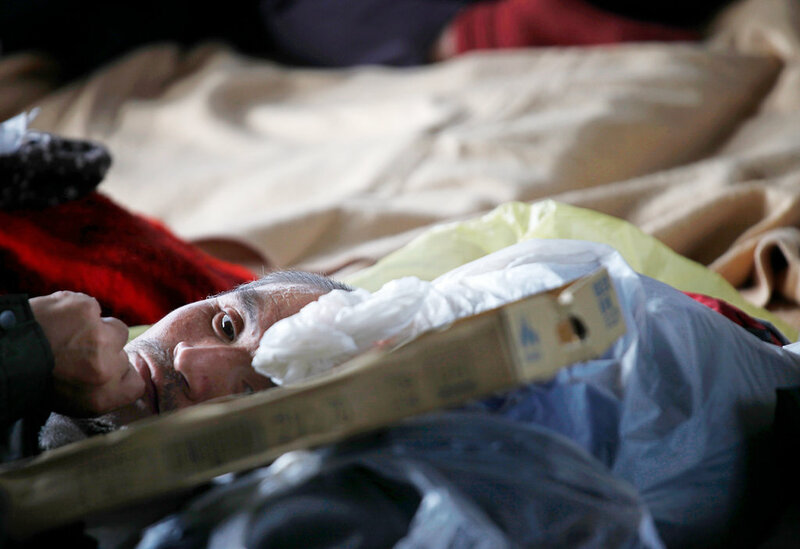 A survivor at a shelter in Yamamoto was resting during the day. 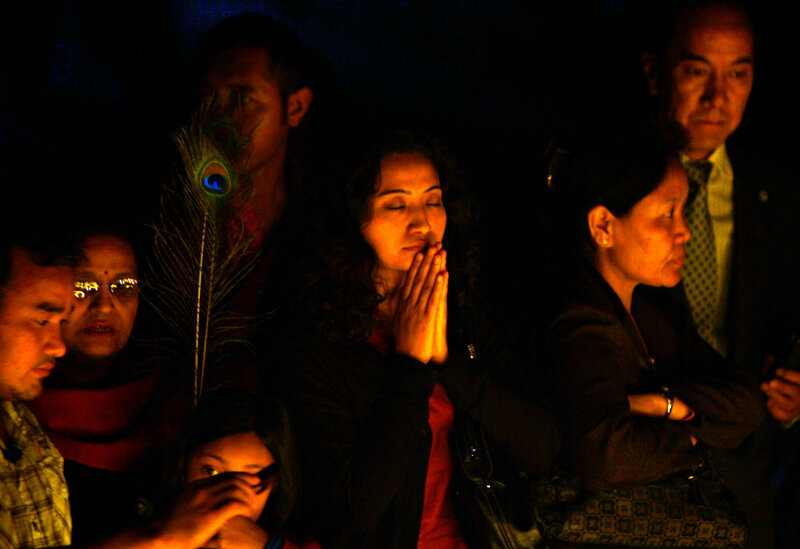 A woman prayed for Japanese earthquake and tsunami victims at Bouddhanath Stupa in Katmandu, Nepal. 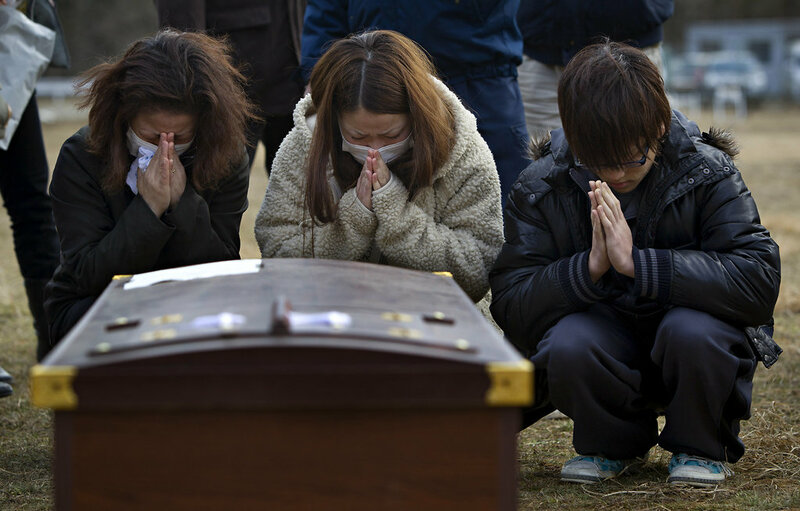 Family members prayed over the coffin of Masami Takahashi at a temporary burial site in Kesennuma, Japan, on Sunday. Cremation of the dead is traditional in Japanese Buddhist practice, but crematoriums are overwhelmed and fuel for the process is scarce. 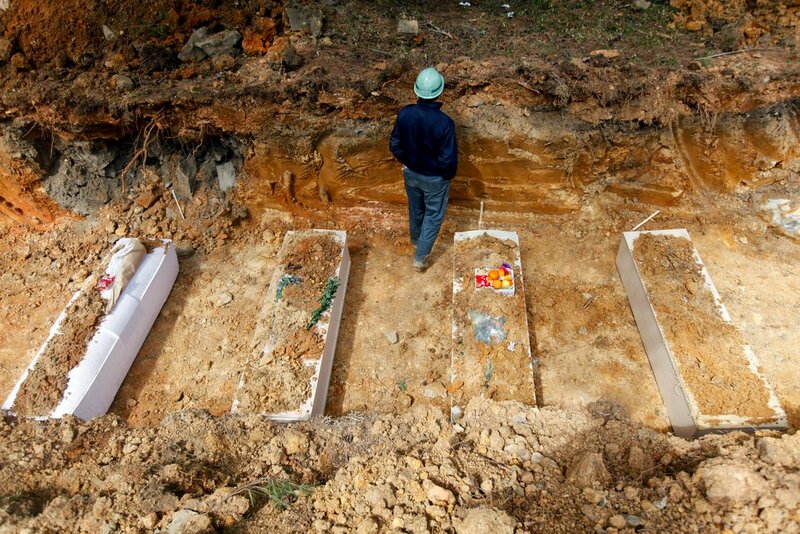 Local municipalities are burying the tsunami victims in mass graves as a temporary solution. 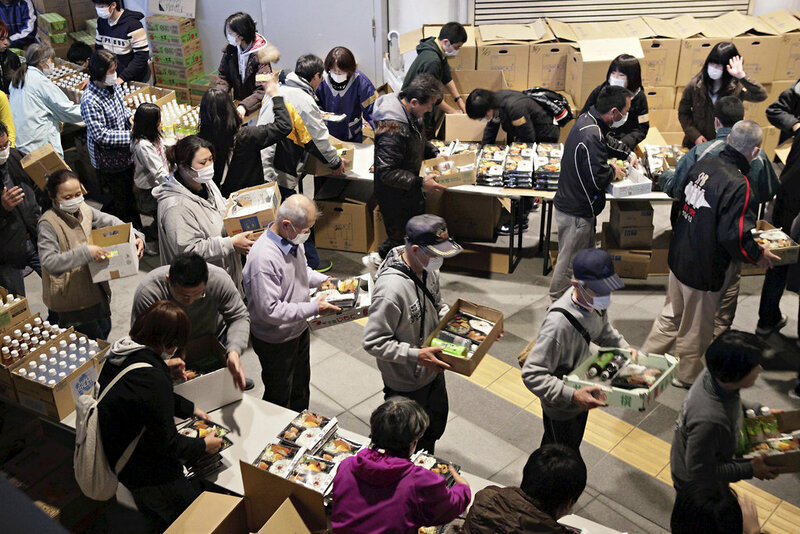 Evacuees from Fukushima, where the troubled Fukushima Daiichi nuclear power plant is located, received dinner at an evacuation center in Saitama on Sunday. 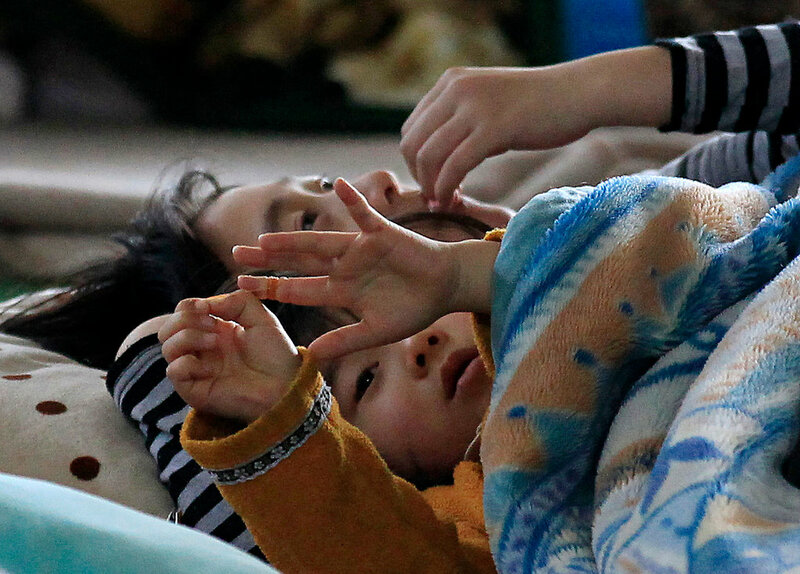 A child and his mother rested on the floor of a gymnasium that serves as an evacuation center in Yamagata. 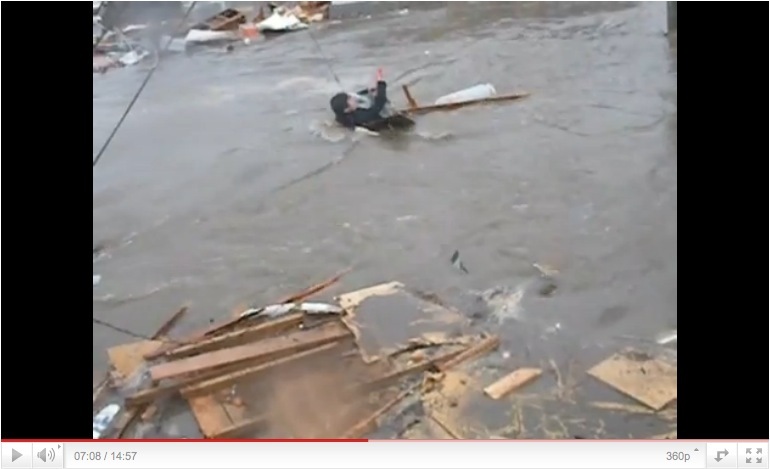 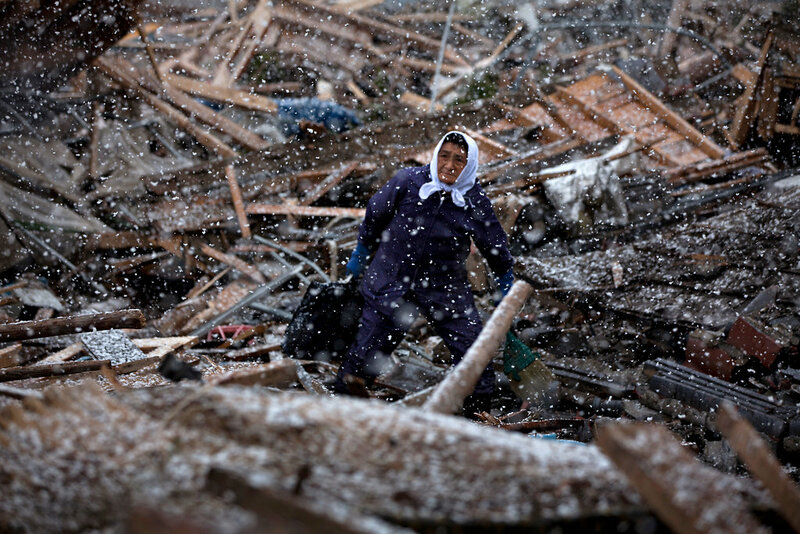 Hiro Ono, 70, collected salvagable items in the tsunami-devastated village of Noda, Iwate Prefecture. 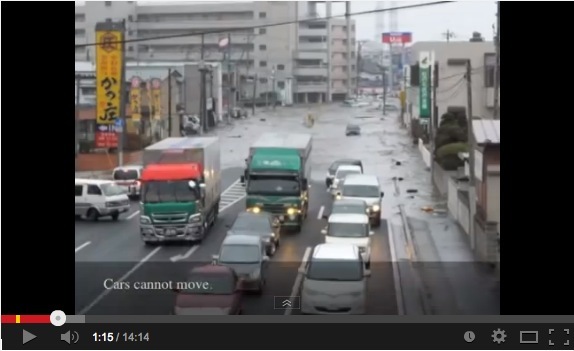 Winter weather continued to hamper recovery efforts in the north of Japan. 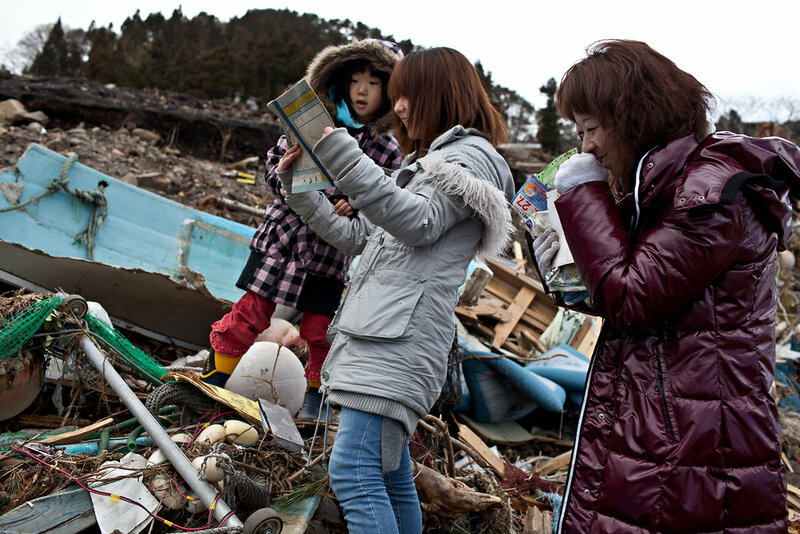 Yukiko Umehara, center, reacted with delight after finding her cousin's childhood diary in the ruins of her house in Tanohata, Iwate Prefecture. 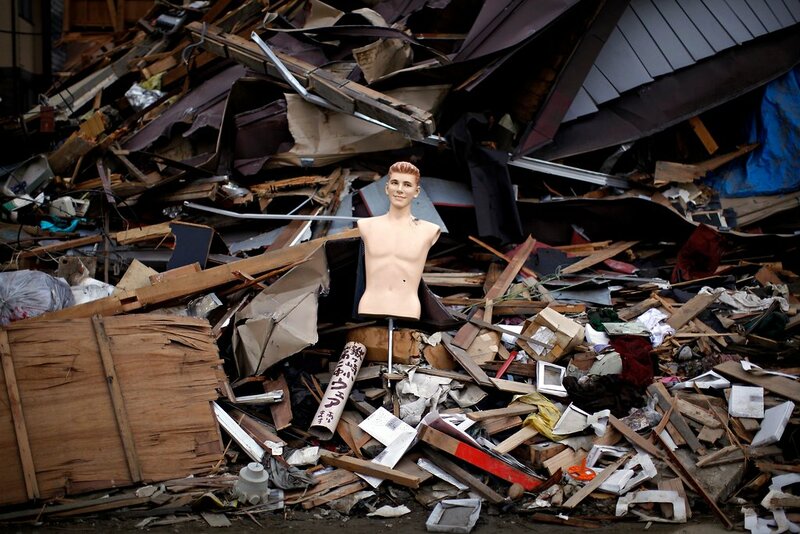 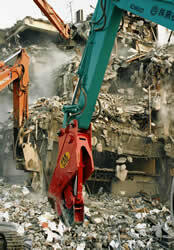 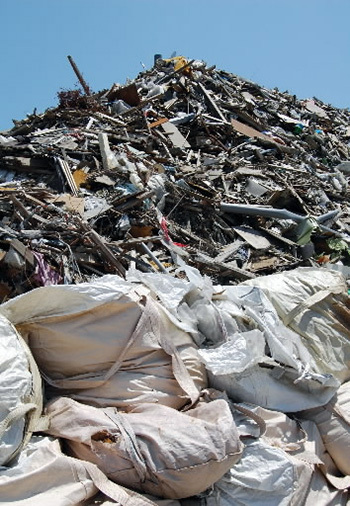 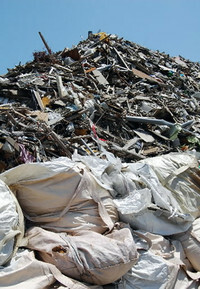 A store mannequin was perched among the debris in the town of Yamada. 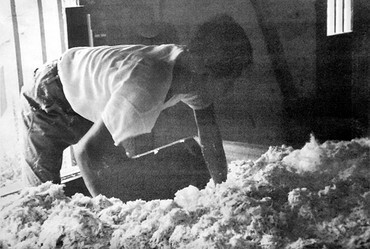 A dairy farmer emptied raw milk onto his pasture in the city of Nihonmatsu, Fukushima Prefecture. 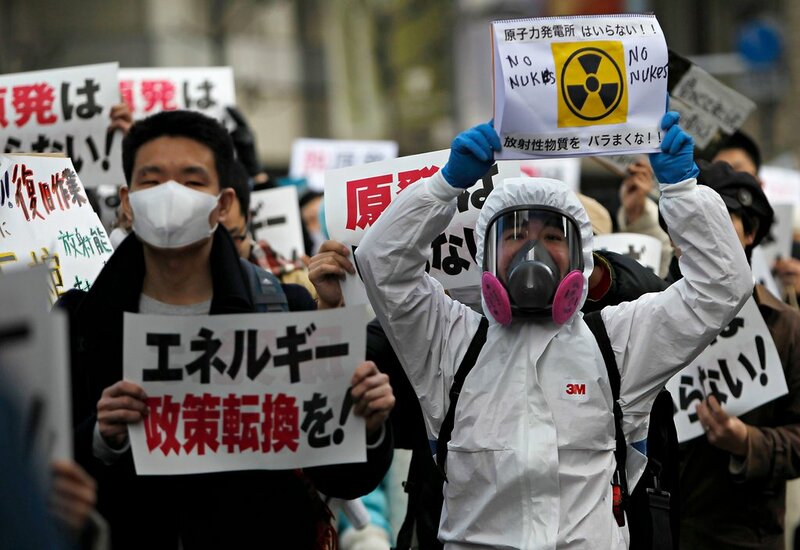 Radiation above the legal limit has been detected in raw milk in the area close to the stricken Fukushima Daiichi nuclear power plant. 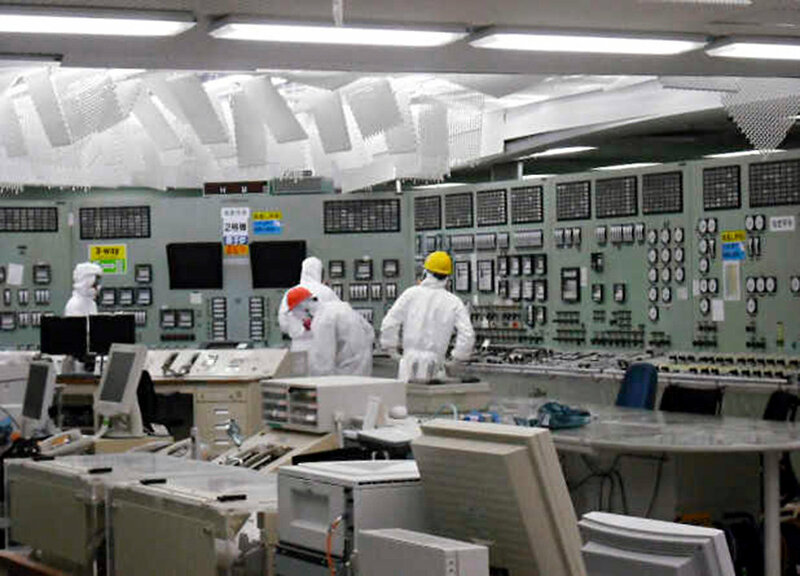 Technicians in the control room of reactor No. 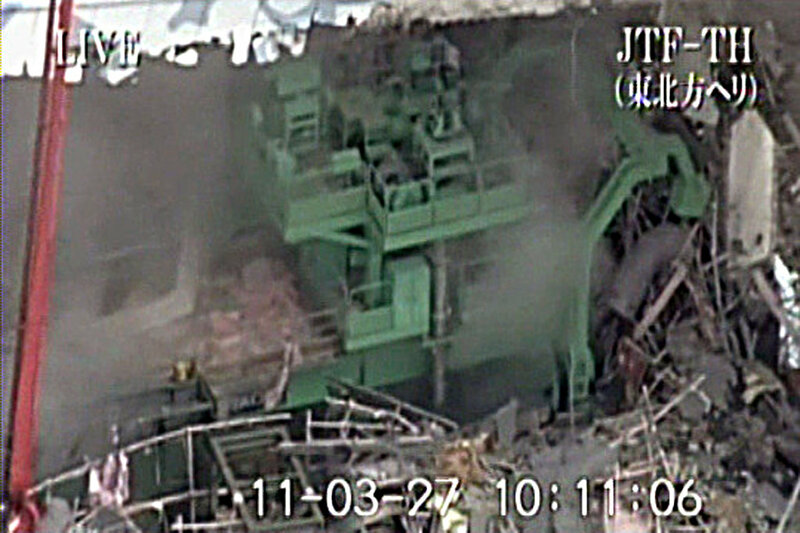 2 at the Fukushima Daiichi nuclear power plant on Saturday, in this photo released by the Tokyo Electric Power Co. 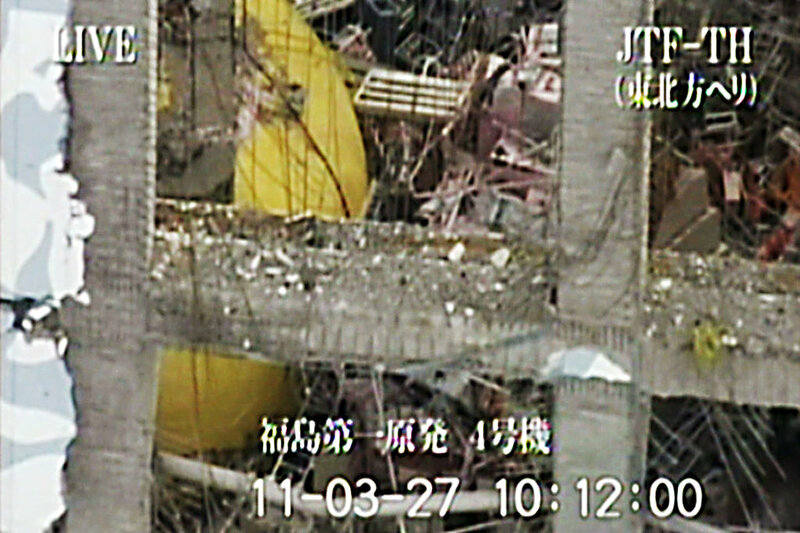 This video image released by the Japan Ground Self-Defense Force via Kyodo News shows the inside of Unit 4 at the Fukushima Daiichi nuclear power plant on Sunday. 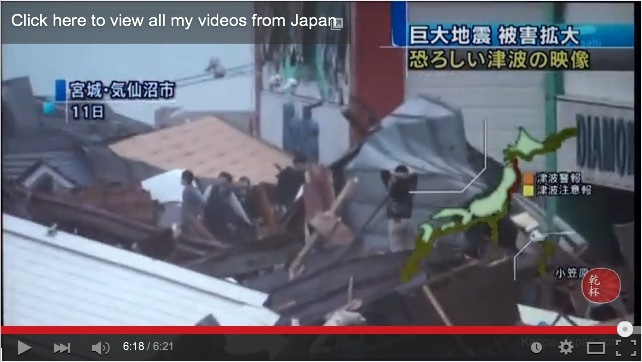 A series of explosions destroyed the outer portion of the building in the days after the earthquake and tsunami struck two weeks ago. 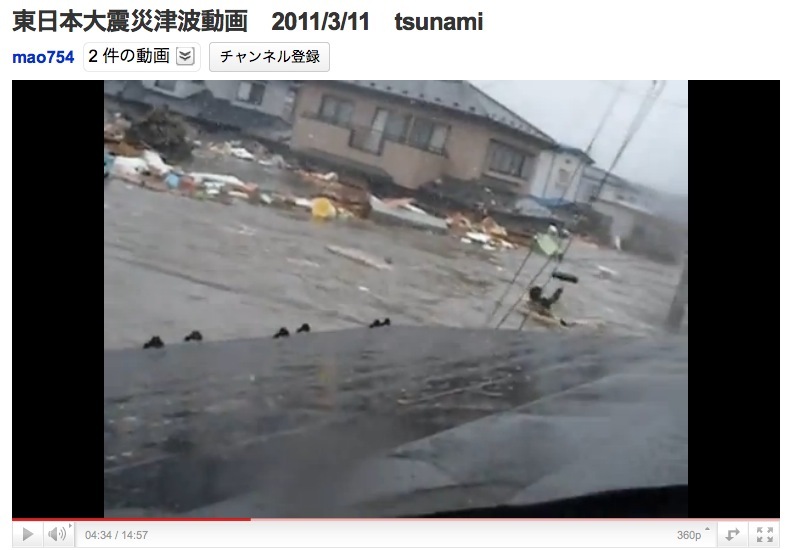 A second video image looking inside Unit 4 at Fukushima Daiichi.